City Chief Exec Peter Ridsdale has told the Sunday Mirror that he himself was offered a sweetner when he was negotiating a transfer involving Robbie Keane. "I can confirm that an approach was made to me. I told my director colleague who was on the trip with me immediately and called our financial director in England to make him aware of the approach. "I also made it clear to the agent that we do not do business like that and never would do." It's said Ridsdale was offfered £300,000. "The difference between me and Ridsdale is, at Chelsea, I always assumed we would finish 10th and get knocked out of both cups in the first round. Anything else was a bonus. "Ridsdale worked on the assumption that they would qualify for Europe every season and do well in both cups. Anything else was a disaster." Bates denies Chelsea were heading for a Leeds-style meltdown until Russian billionaire Roman Abramovich took over. He told The Times: "We had a £75million bond that was used to build the hotels and the best stadium in Europe. "That was like a mortgage. The only debt was £20million and that was containable because we qualified for Europe. But we had £150million worth of assets. "The two hotels were worth £50million. 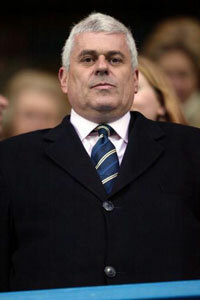 We spent money on assets, not like bloody Ridsdale, who spent it on players."